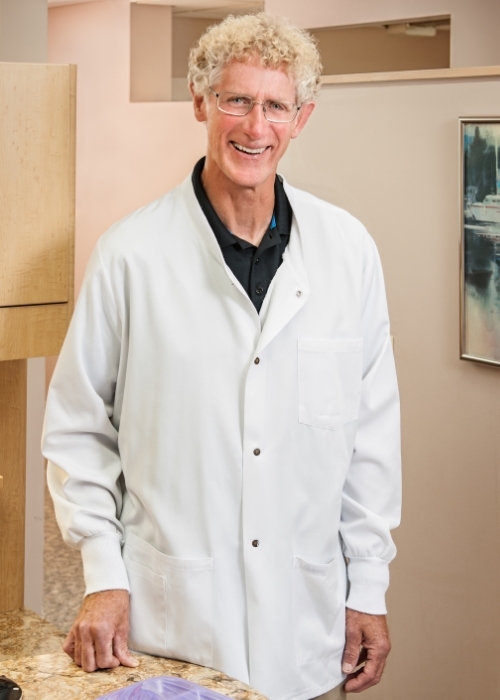 I enjoy being a dentist in a family dental practice because I love the ongoing relationships that develop over time between patients, their families, and our staff. I also love the ever changing nature of dentistry. The new materials and techniques, the advances and great strides in technology, coupled with the increasing research revealing important relationships between oral health and general health, make each day in our office a fun, exciting, and enjoyable experience. I was born and raised in Seattle and still love living in the Pacific Northwest, especially the Puget Sound area. After graduating from Nathan Hale High School, I attended the University of Washington and received a Doctorate of Dentistry from the University of Washington School of Dentistry. Following my graduation from dental school, I completed a General Practice Hospital Residency at the Naval Hospital, Oakland, CA. I practiced for three years as a dentist in the Navy, with tours of duty at Naval Station Adak, Alaska and Whidbey Island Naval Air Station, WA. Upon completing my Navy obligations, I returned to the Seattle area with my wife and two sons. I take advantage of the many activities available in the Puget Sound region. I enjoy hiking and backpacking, boating and kayaking, as well as cycling this beautiful area. When not exploring the Pacific Northwest, I treasure time spent with my sons and their wives and my grandchildren. I am a member of the American Dental Association, the Washington State Dental Association and the Seattle-King County Dental Association. I stay abreast of new techniques and technology with my involvement in Continuing Education Dental Courses as well as my membership in the Premier Dental Study Group and the Burien Dental Study Seminar.